KAIZEN is a Japanese word KAI and ZEN. KAI means change and ZEN means better. Hence implies change for better or improve continuously. "If you are content with the best you have done, you will never do the best you can do." Continuous improvement is a program, a philosophy and a strategy to improve the quality of goods and services of an organization. Everything deteriorates with use. Maintenance programs check the inevitable decline, but don't improve processes. KAIZEN involves process changes. Renewal of a process can result in a major improvement in performance. KAIZEN is a systematic approach which focus on process improvement. KAIZEN is not a result oriented approach. The major mistake while implementation of KAIZEN is focus on result rather to focus on the process. The pillars of KAIZEN are teamwork like QC circle and competence in problem solving like PDSA cycle. PDSA cycle refers to Plan-Do-Study-ACT. Reducing non value added activities. Team dynamics including problem solving, communication skills, and conflict resolution. Before implementation of KAIZEN it is necessary to spread awareness of KAIZEN implementation among the employees. To implement KAIZEN the supervisory staff and the front line employees must be trained on KAIZEN techniques, objective and benefits. KAIZEN should be implemented by teams. Make the QC Circle teams in which the employees participate voluntarily. In teams employees motivate each other, brainstorm to kill the problem, use best available techniques to implement KAIZEN. SPC is necessary part of KAIZEN. All employees who are taking part in the KAIZEN must learn basic statistical concept of SPC to control the variation of the process. Communication is another mantra for success of KAIZEN. Visuals at workplace, verbal, and non-verbal communication play an important role in success of KAIZEN. Training of all employees should be in local language. Reward and Recognition are another factors responsible for the success of KAIZEN. These serve the motivation to the winner along with coworkers. Choose the best KAIZEN champion of the week, month, and quarter and award for his achievement. Let the employees free to choose their problem by their own. This way most of the problem will come into the picture and the move to solve the problem could be taken. Rid out the pre-conception. Like; This can't be done, This can't be implemented, I have done everything what I have required, KAIZEN can't be implemented at this place, etc...... All these types of conceptions are big hurdles to implement KAIZEN at workplace. "You are not failed until you actually failed." KAIZEN is a team based process oriented approach,hence don't think about the result just make an effort to improve from the previous stage. 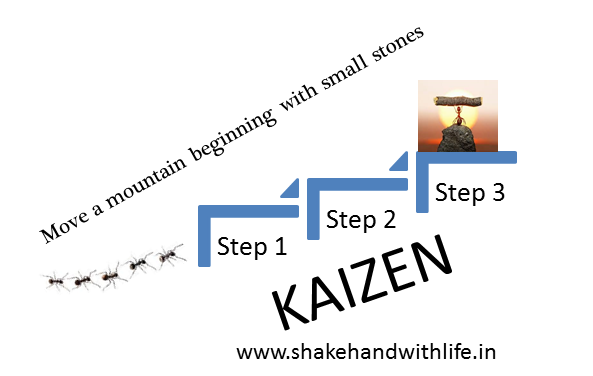 KAIZEN can be best learnt from the Ants, always working in teams and complete the big task in small parts.